One of the great things about visiting San Francisco is that wine country is right in the city’s backyard. 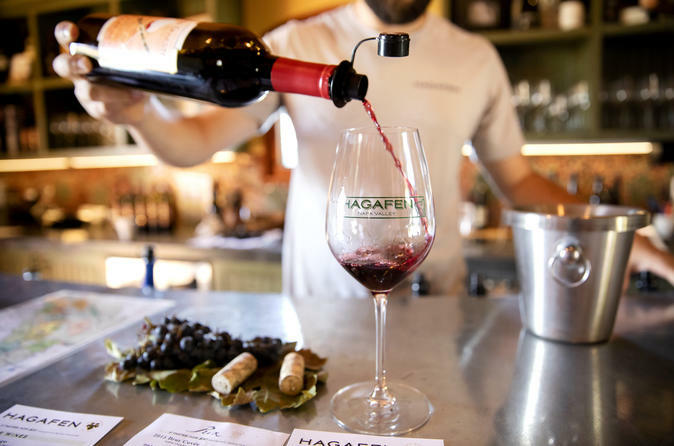 Travel through Napa Valley in a comfortable minibus, stopping to sample an array of wines at three boutique wineries while learning from your guide about the area’s history and culture. Each winery has been carefully selected for its unique character, knowledgeable and friendly staff and lovely ambience. Take a tour of a winery and see how wine is made, and sample five or six wines at each stop. Includes hotel pickup and drop-off. Napa Valley, the esteemed wine region whose name has become synonymous with great vino, is a region of rolling hills coated with vineyards. There are so many that it can be hard to know which wineries to visit. That element is taken care of for you on this guided 8- to 9-hour tour, which includes stops at three boutique wineries. After getting picked up at your San Francisco hotel, enjoy the ride to Napa Valley. Listen as your guide regales you with stories about San Francisco’s diverse neighborhoods as well as about the history of the city and of Napa as you make the short drive to wine country. Visit three family-owned, award-winning wineries and sample five or six types of wine at each stop. Experts offer a detailed explanation of how the wine is made. You’ll impress your friends with your newfound knowledge of Napa Valley wines. Stop for lunch (own expense) at the Oxbow Public Market in Napa, where the food choices include everything from artisanal sandwiches and pizza to oysters and ice cream. At the end of the tour, with your appetites for food and wine sated, enjoy the trip back to San Francisco, with drop-off at your hotel.